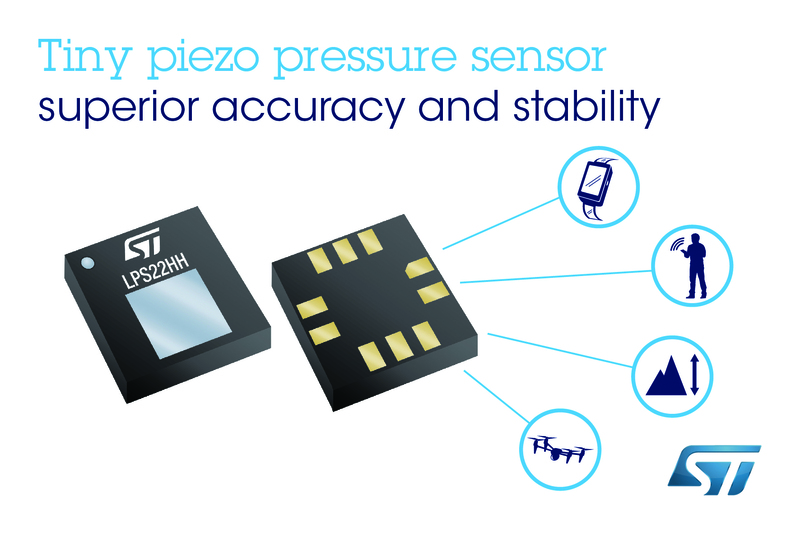 Geneva, November 22, 2018 -- The STMicroelectronics LPS22HH MEMS piezoelectric absolute pressure sensor is so accurate and stable that manufacturers can eliminate one-point calibration (OPC) after soldering to increase throughput and efficiency. Energy-conscious features include a 0.9µA power-down mode and low active power, drawing just 4µA at 1Hz, including temperature compensation, to maximize battery runtimes. Support for I2C, SPI, and MIPI I3CSM 2-wire sensor-bus interface provides flexible digital connectivity, and there is a generous 128-bit FIFO for storing sensor data to minimize host intervention. The LPS22HH is in production now, packaged as a 2mm x 2mm x 0.3mm 10-lead HLGA, priced from $1.55 for orders of 1000 pieces.